Create convenient take-out options with this Newspring NC-718-B 16 oz. 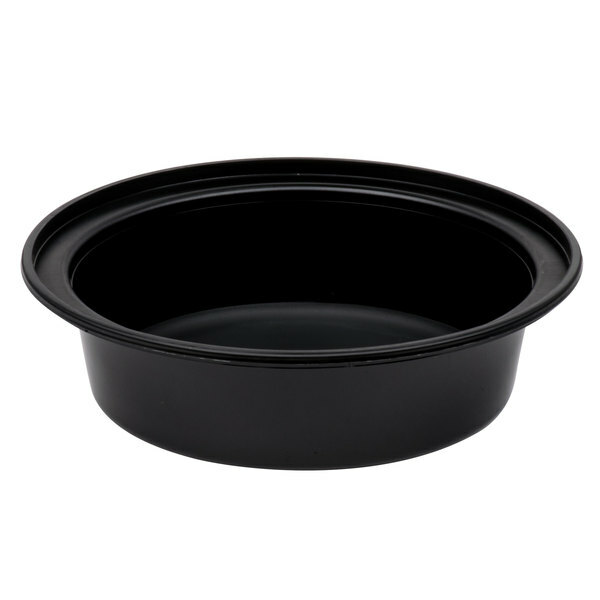 black 6" VERSAtainer round microwavable container with lid. 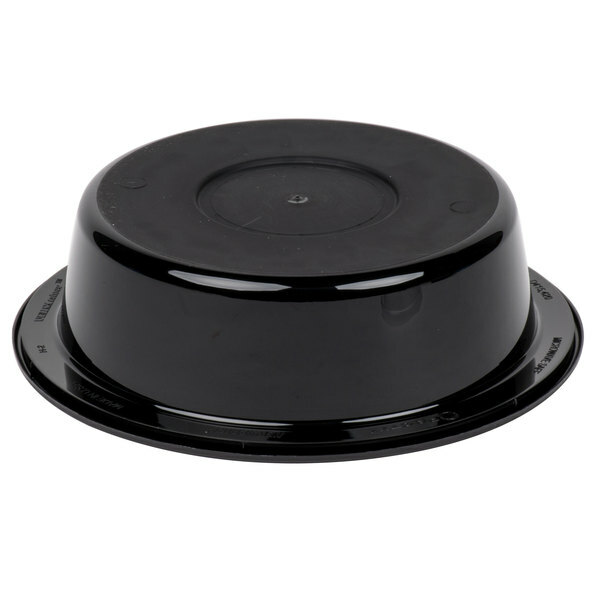 This black container includes a clear, tight-fitting lid for optimal product visibility and protection from messes and spills. Its 16 oz. capacity makes it perfect for salads, pastas, and small entrees, and its flat top and bottom ensures easy stacking in to-go bags. 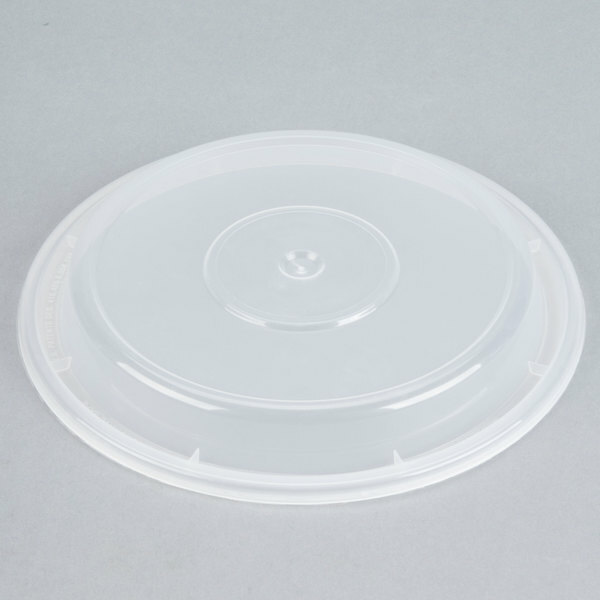 Use it for packaging food at your kiosk, food truck, convenience store, or casual restaurant! 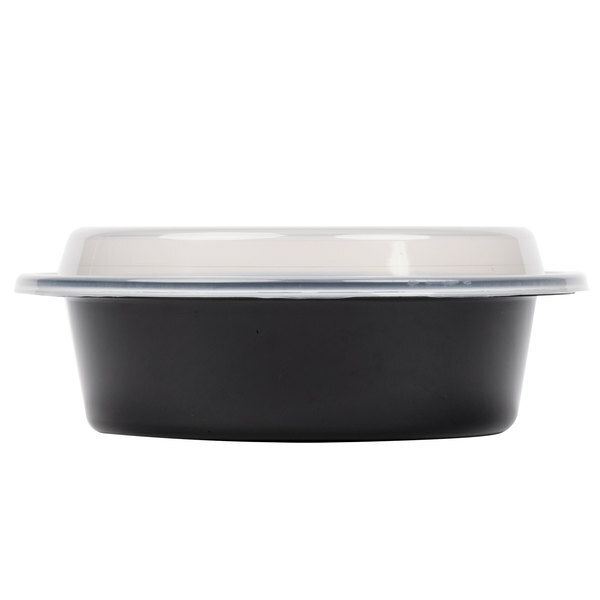 "A great container and lid combo for your food needs. It's goes on tight and secure keeping your ingredients safe and sound. A great container for serving to go foods or what ever you might need." This container is made of durable, heavy weight polypropylene that's strong enough to support hefty foods without bending or cracking, yet light enough to make transportation simple. 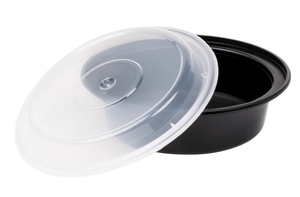 Thanks to the thick walled design, this container is perfect for keeping cold items cold and hot items hot. 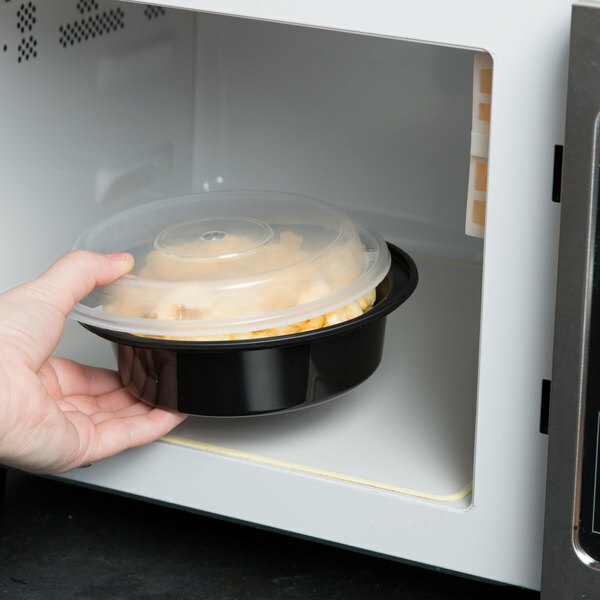 It can withstand temperatures between 0 degrees Fahrenheit and 250 degrees Fahrenheit, making it freezer friendly and microwave safe. 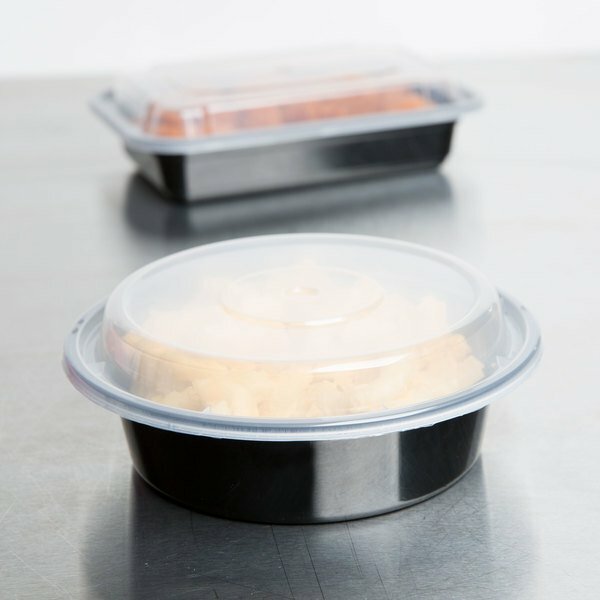 Customers will appreciate the convenience of freezing and reheating meals from the same container! 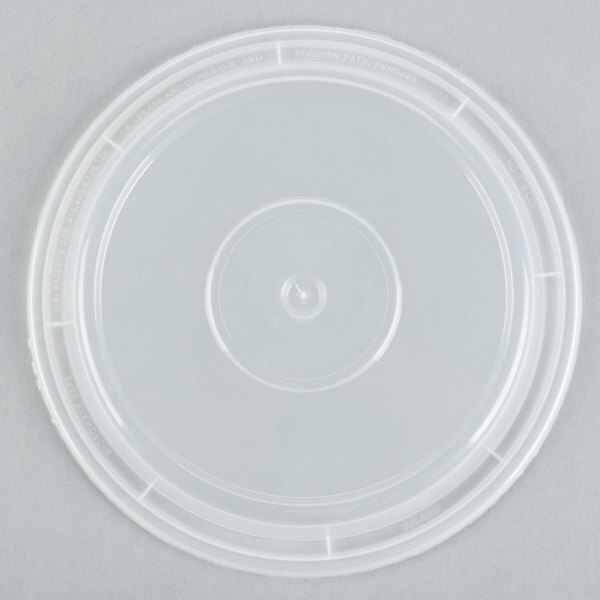 Thanks to the clear lid, your customers can easily identify the food inside each container without having to repeatedly open the container. This helps keep food fresh and contaminent-free at your grab-n-go lunch stand. Plus, the lid is leak-resistant to help keep the contents from dripping or spilling. 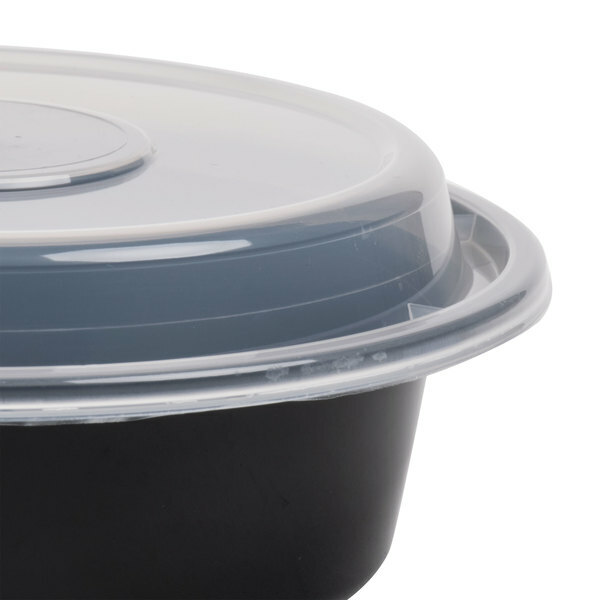 What is the difference between capacity and flush liquid fill on this take-out container? The capacity given demonstrates how much solid food this container can hold when it is filled to the top leaving room for a lid. The flush liquid fill measurement refers to the amount of liquid that this container can accommodate without spilling over the edge or interfering with lid placement. Flush Liquid Fill 16 oz. these have been fantastic! We buy multiple sizes to use for our to go items. They work great in the microwave and don't melt or deform. 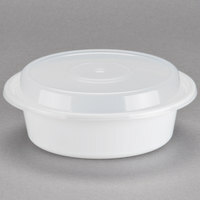 Great size container for to go dinners seals with a tight fit. 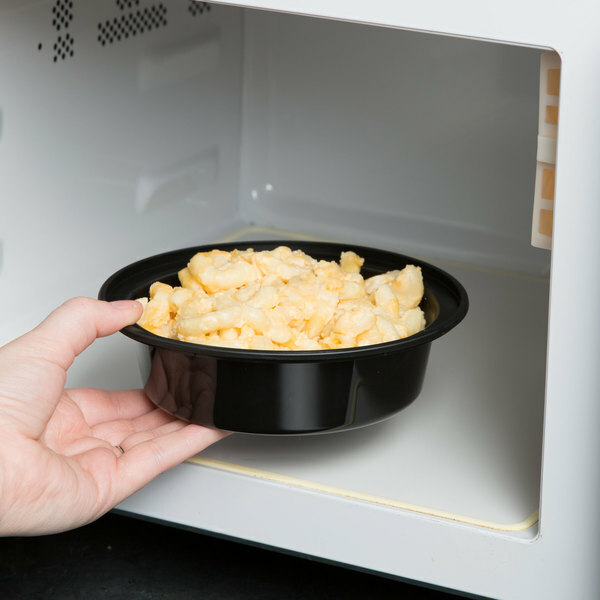 Hold up well in the microwave when heated. These containers can be used over and over again would highly recommend. A great container and lid combo for your food needs. It's goes on tight and secure keeping your ingredients safe and sound. 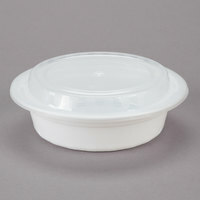 A great container for serving to go foods or what ever you might need. These containers are a little expensive but worth it. 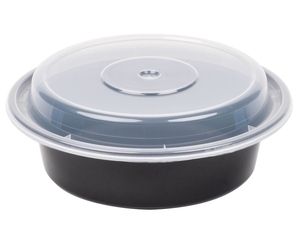 They travel great for delivery and the lid is as near to airtight as you could get in a disposable container. They also hold well in our warmers. We've used these for 2 years in our ice cream shop. We use them for frozen ice cream "pies", so not only do they work well in the microwave, they work well in the freezer too. The newspring NC-718- b Black 16 oz. 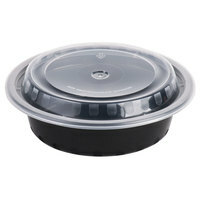 VerSAtainer 6' x 1 1/2" Round Microwave Container with Lid sold 150 per case. 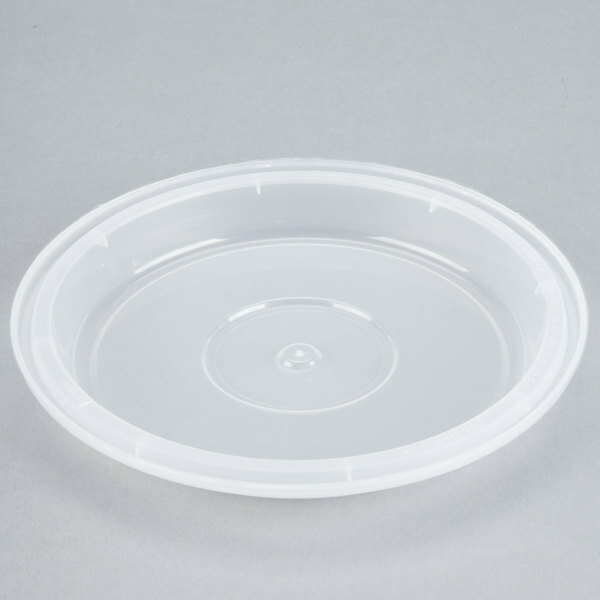 The container is made of injection-molded polypropylene. Great for microwave .I am preparing meals in advance to surgery for my family, These are working great. I use these containers for prepared meals. Great size durable and stand up to being reheated several times. I love the clear lid that lets customers see their meals. I originally purchased this item because my daughter was diagnosed with a severe food allergy and I needed a freezer and microwave safe container to take her food to school. After bulk cooking for her one weekend, I realize this was a great inexpensive way to keep healthy food in the freezer for my entire family. These bowls are perfect for small desserts and they are heavy duty. I would recommend these bowls and lids to others and purchase again. Very satisfied with this purchase. These containers are very versatile. I can use them for salads, small sandwiches and I can also showcase cupcakes and brownies. They keep everything fresh and stable for delivery. This is the ideal size to put in a lunch bag. Needs a hole in the lid to keep it from popping of in microwave. These are fantastic. Not only are they microwave-safe, according to Newspring, they are also dishwasher and freezer safe. They seal up very well and will not leak, even with soups and the like. 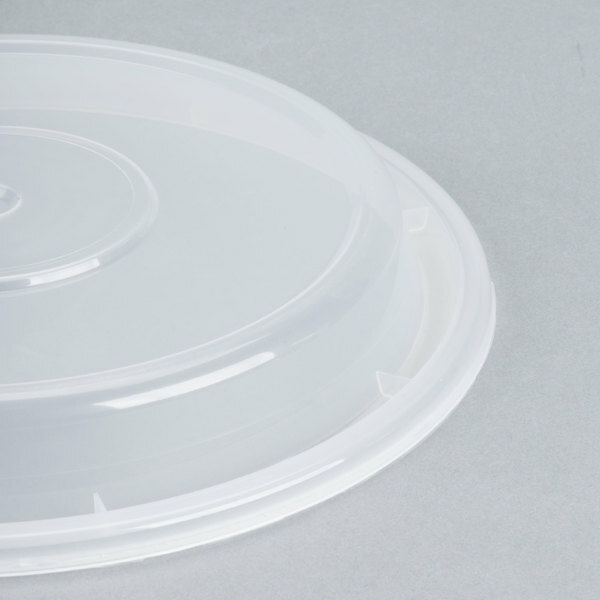 Both the bases and the lids are stackable so they don't take up too much room.